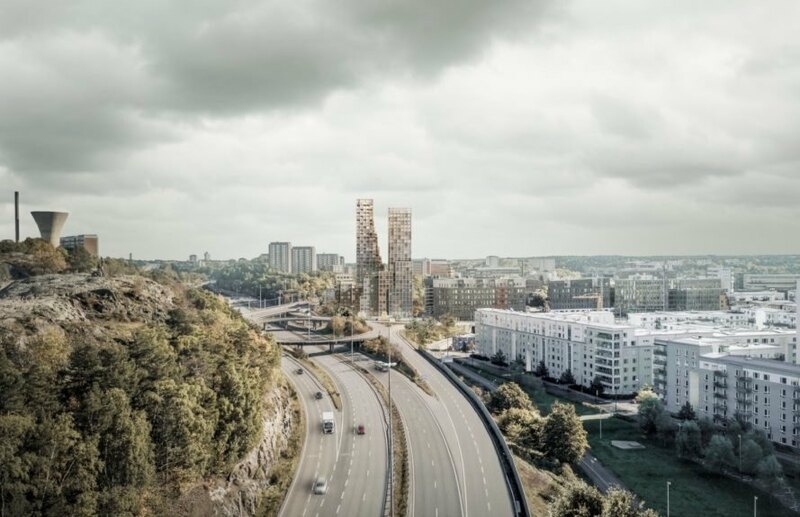 Stockholm-based Kjellander Sjöberg Architects recently won a competition for Nacka Port, a new district between Nacka and Stockholm. Envisioned as a sustainable destination, the urban block would consist of a rich mix of programmatic functions including residential, retail and public spaces that are easily accessible to pedestrians and cyclists. 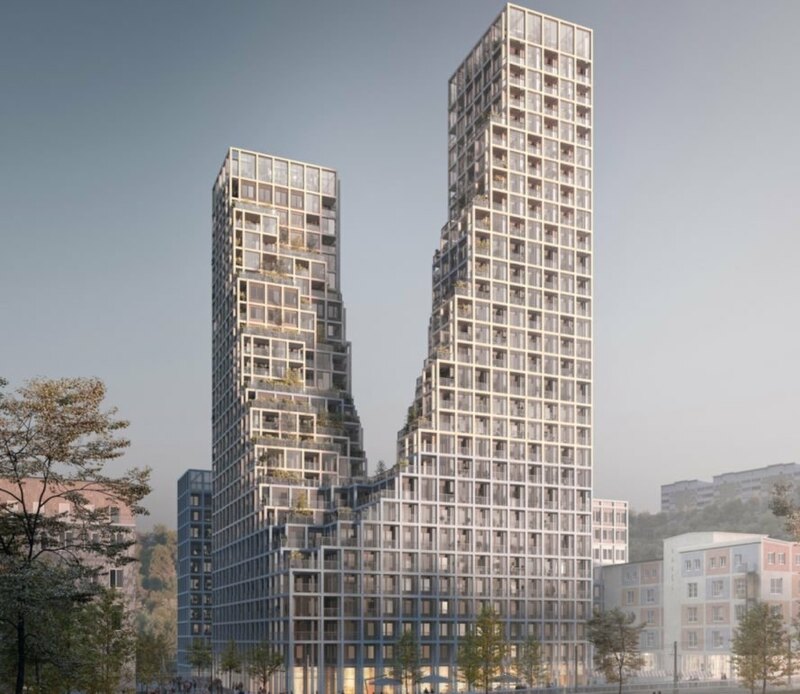 In addition to new green space, the architects plan to insert “carbon positive” towers constructed from renewable materials that promote a healthy microclimate and sustainable lifestyle. Located between the commercial center of Sickla köpkvarter and the district of Hammarby Sjöstad, Nacka Port is ripe for redevelopment with its turn-of-the-century industrial buildings, such as the Klinten paint factory, and backdrop of greenery. Furthermore, the site is located at the intersection of two main traffic routes. The architects designed the new urban block, named “Klinten,” as a “city within a city” and an attractive destination for both residents and visitors at all hours of the day. 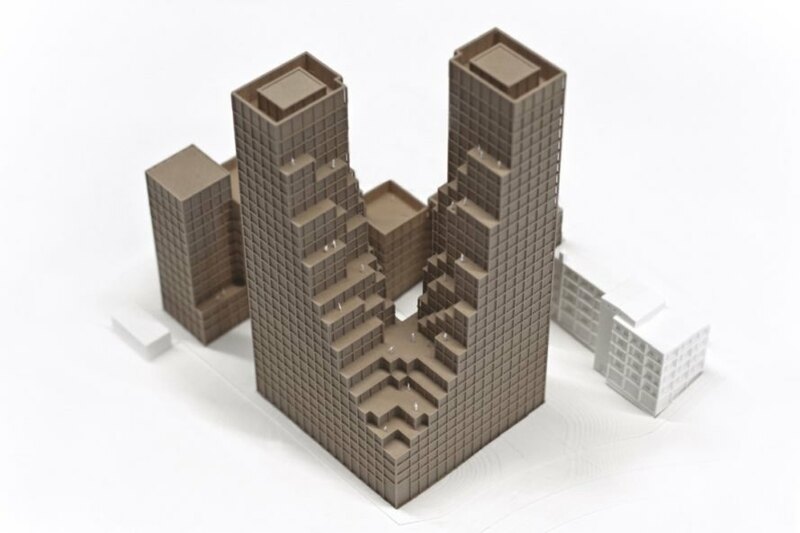 Two proposed towers feature terraced levels that step down to a shared podium and anchor the site. The staggered glazed facades face the south and will have communal and private terraces dressed in greenery. In addition to residences, the mixed-use development includes a market, restaurants, a bike-cafe, coworking spaces, a hotel and gym, artist studios, workshops and other communal facilities. “The block is designed to generate local urban life, where one feels at home with the freedom to take personal initiatives, where residents are encouraged to use the outdoor environment for co-creation or just meet and socialize,” the architects said. 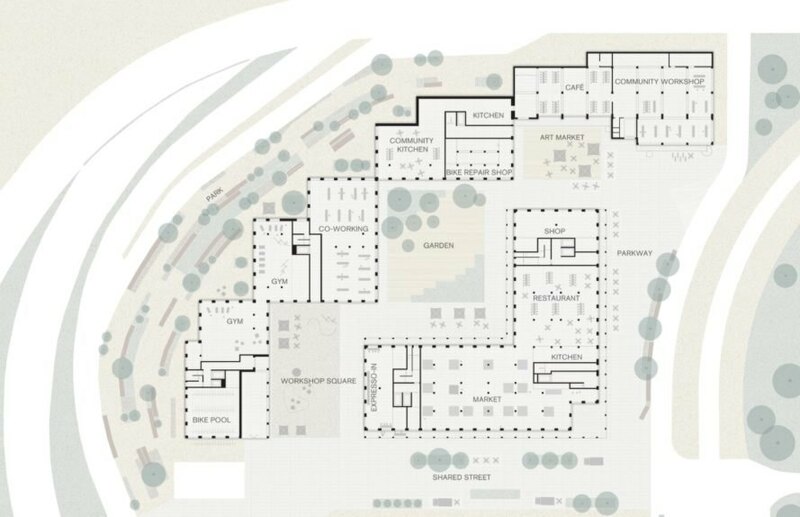 To engage users from multiple directions, the team surrounded the site with attractive green space and strategically located the buildings to maximize sight lines from the surroundings. “The core of the Nacka Port concept focuses on creating a positive vision of the future needs of both humans and our planet,” the architects said. “Nacka Port will be a place to connect and create an inspiring urban and sustainable lifestyle.” The planning process for the project has already started, and the official binding development plan is expected in 2020. Kjellander Sjöberg Architects envisioned Nacka Port as a sustainable destination. Nacka Port is located close to Stockholm and next to major roads. There will be both private and communal terraces that overlook views of the city. The urban block will include markets, coworking spaces, restaurants, art studios, a hotel and more. The proposed towers feature terraces that face south. The project aims to create a place that helps both people and the planet thrive.